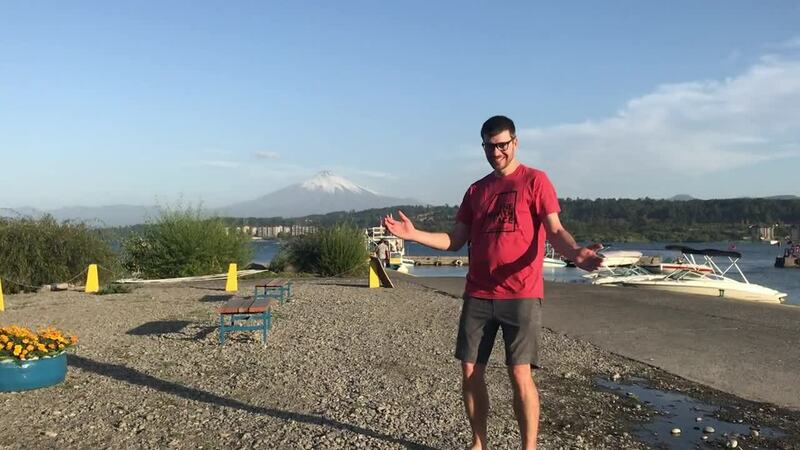 For week 2, we cycled out of Osorno after the great bag heist of 2019, and made our way to Los Angeles, Chile. 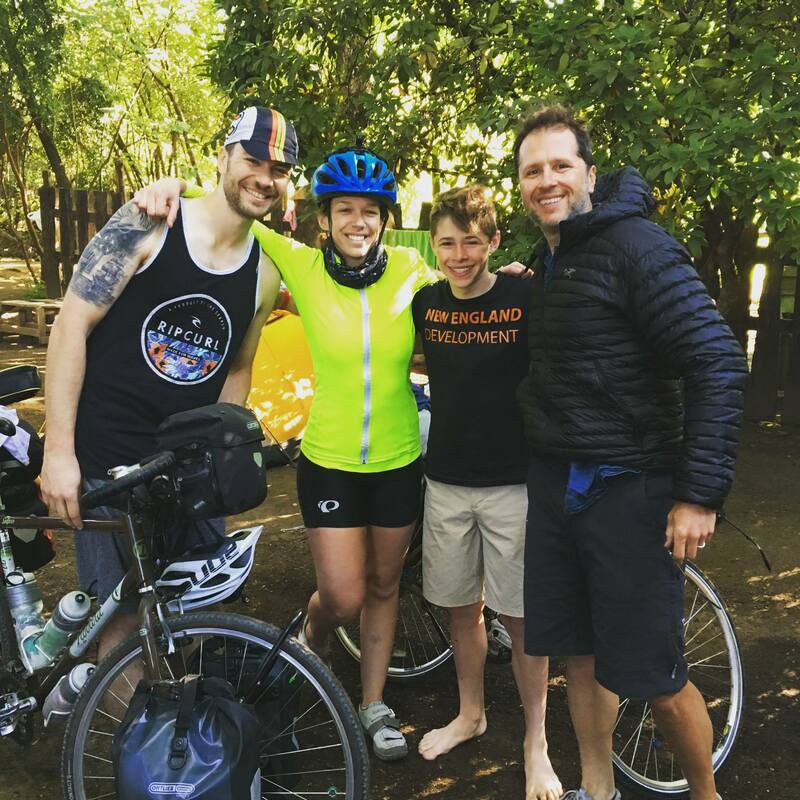 For these weekly recaps, we are going to publish the nitty gritty details of our ride. 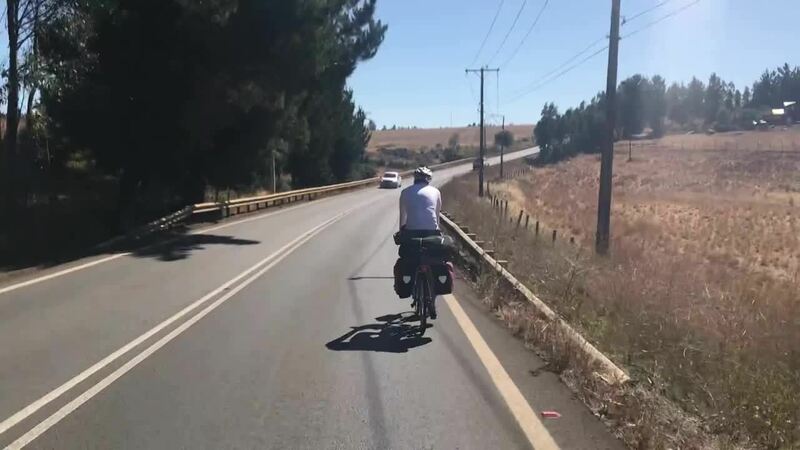 While mostly useful for other cycle tourists, we hope you'll find these entertaining and informative for making your way through the regions we visit. Rather than take the Rio Bueno exit off the highway, we stayed on the road and cut through a hole in the fence where our overpass with the T-55 was. The hole was already there so let’s all just calm down. The T-55 was relatively uneventful. It was the heat of the day, and so the long straightaways on flat roads tested our mental strength more than physical. A quick Tienda stop outside of a ranch helped boost our spirits once we got some Fanta in us. 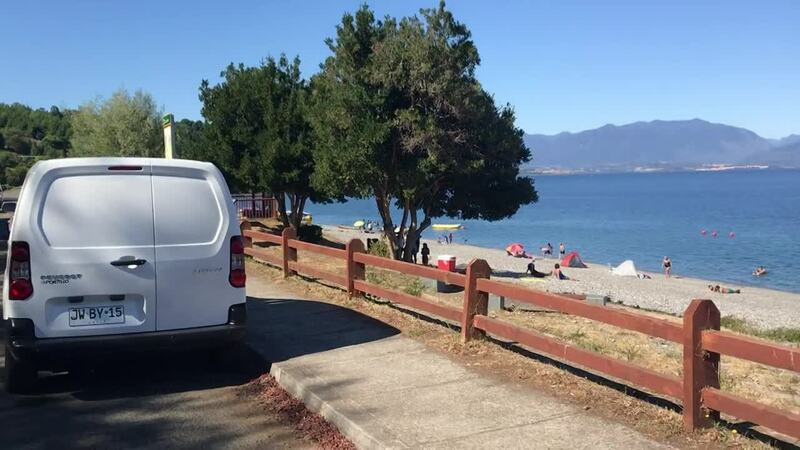 We finally reached the lake, Lago Ranco, and that’s when we fell in love with this route. For the rest of the day, we were blessed with sweeping views of the water and mountains as we crested hill after hill. The going was slow with all the ups and downs, but we did not really care since we had such a beautiful scene to behold. The pics won't do this justice, but to Ski it resembled his time in the Swiss Alps. In the morning, we climbed up out of Futurno (this is a trend for all towns in the lakes region it seems) and onto country roads towards Los Lagos. There was virtually no traffic and good quality roads, so it was nice to be able to ride side by side for the day. As we got closer to Los Lagos, our water situation became concerning. Once at the intersection with the T-39, we made the call to go right rather than head into town in search of water. This turned out to be totally fine. A few kilometers down the road, we crossed a big river and were able to scoot down and have lunch under the overpass. We even got to dip our toes and shirts into the water to cool off a bit! The rest of the day, traffic picked up as we got closer to Panguipulli. 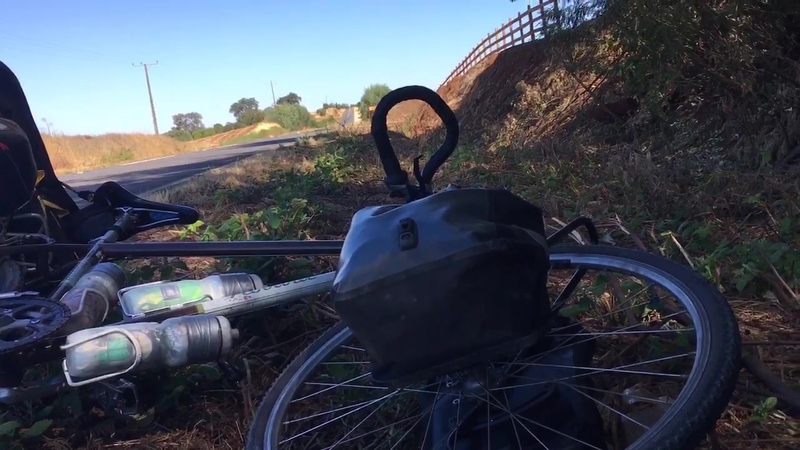 If there is another way someone finds to cut through and avoid the main roads, I’d recommend it, but from our research everything looked like loose gravel. With heavy traffic closer to the city, we put our heads down until finally reaching town. The town is way bigger than we thought and a real backpacker paradise. It reminded me a lot of Southeast Asia and being back somewhere like Siem Riep. That night, we camped at a site north of the main rotary, which turned out to be a great idea. We met fellow New Englanders, Tom and Luca, and had dinner with them. They both are from Durham, NH… only a few miles from where Ski grew up in Barrington. Crazy! 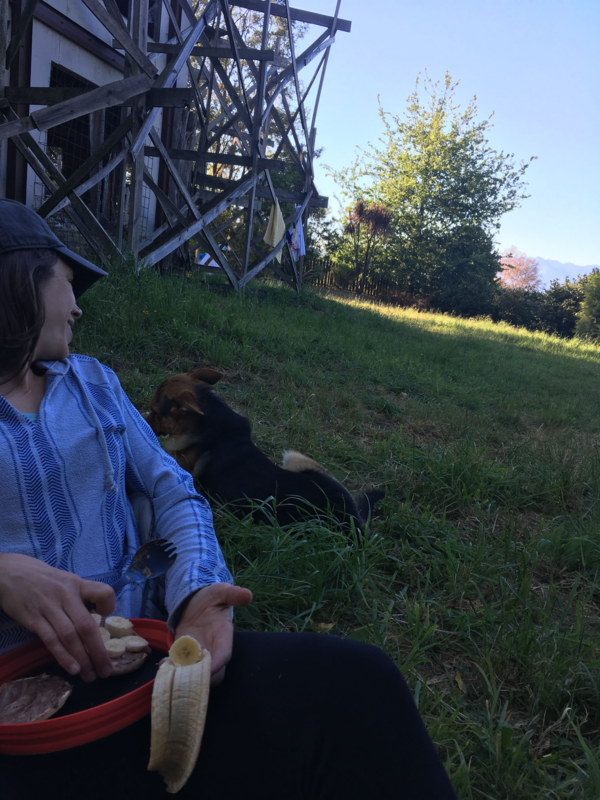 Leaving Panguipulli, Suzie and Ski were feeling good, like real good. Like, I’m ready to take every single bend and climb in the road by the shoulders kind of good. The road out of Panguipulli was quite nice. We were on farm roads as Volcan Villarica appeared on the horizon. If you have never seen it before, it is a beaut and something we were excited to ride in the shadow of. We were cracking jokes, singing songs, and then… had a decision on our hands upon reaching the loose gravel road S-239-T. We were told this was only unpaved for a few miles. Even after pedaling a mile and being uncomfortable skidding along with cars periodically kicking dust up past us… we pressed on. About an hour into the slog, we started going up, and up, until it was no longer possible to ride. Both our tires kept skidding out from under us, and Suzie’s handlebars kept trying to buck up and flip her over. And so… we pushed… and pushed.. And pushed our bikes up for 5 miles and about 1K feet. It was not a fun part of the ride and pretty much shattered hopes of us getting further than half-way through our planned route. As we crested the top, we ran into Daniel and Julia, two Canadian cycle tourists who were making there way to the Carretera Austral. They assured us the top was close before parting ways with us. Sure enough… they were right. It was a nice downhill into Villarica, where we quickly found a hotel and showered ourselves from all the dust on the hill of doom. Villarica… is lit. It’s a gorgeous mountain town set on the west bank of Lago Villarrica and beneath a massive volcano. We ate a massive meal, drank some wine, and walked the festive streets together. All around, it was a nice end to a tough day. The ride from Villarica to Routa 5 didn’t have many major ups and downs, and the road is quite pleasant. Though the traffic was okay at first, as you get closer to the highway the traffic picks up. The shoulder is just big enough for a rider to feel mostly okay, and though cars are generally great at giving you space, as traffic increases, so decreases the ability for high-speeding cars to shift into the other lane to pass you, meaning a tight shoulder for you as cars whizz by. By the time we reached Routa 5, we were ready to be off that road. The good news is that right before the merge onto The Five (and before there is a left for Freire), there is a truck-stop diner built out of an old van on the right side of the road. Here you can get a very basic, but amazingly delicious and satisfying meat and cheese sandwich on homemade bread for just a few bucks. Its a nice break from the busy road, which you’ll need even more once you hit Routa 5. The Routa 5 run from north of Pitrufquen to Temuco is fast but no fun at all. This is the major North to South highway that connects the entire country. It is as big, loud, and noisy as any highway you’ve driven on before, with three lanes going each direction and bigrigs racing past each other to get their deliveries on time. The only difference is that the breakdown lanes are also acceptable for bicyclists to ride in. Yes, you will see helmet-less locals crusing down the side whilst 18-wheelers speed by at +100kph (+60mph). Suzie was visibly terrified during this 33.7km, though it made her pedal faster and felt shorter than 33.7kms usually would. From our POV, Temuco is not a city worth seeing or staying in. It is, though, a hint to the cities you will meet while riding from Chol Chol and northward on the S-16, the old North-South main road, which parallels Routa 5 and isn’t nearly as fast or busy (more on that in Day 12). 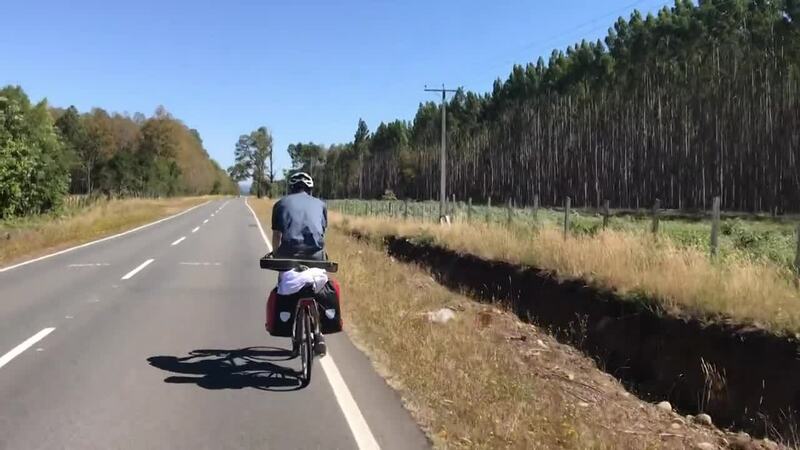 Riding from Temuco to Chol Chol puts you in the dry, deep, and rolling hills of the Chilean Valley. Centered between the breathtaking Andes to the East, and the breathtaking Cordillera de la Costa (Chilean Coastal Range) to the West, this type of landscape is what we Californians refer to as “The Valley” (hint: it doesn't have a positive connotation). If you’re from Cali, think of Temuco, Chol Chol and any other city in this region as the Bakersfield or Fresno of Chile. 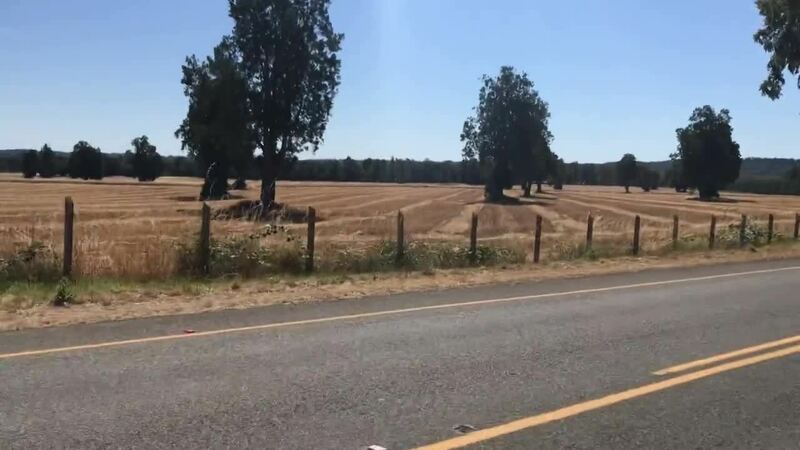 Once you depart the underwhelming Temuco, the dry and seemly deserted hills start rolling, as does the heat, another hint as to what your time in The Valley will be like. We decided to take the S-16, which is the old N-S main thoroughfare for a few reasons. First, Routa 5 is loud and terrifying and we prefer not to cycle just to cycle. We like to enjoy the scenery, be able to talk to each other when we bike, and meet interesting people in small towns along the way. We also had less than a week left before our 160km/100mi climb over the Andes Mountains and needed all the training we could afford. Unfortunately, if we could do it all over again, we would likely choose the road more traveled. Have you ever heard the phrase “We’ve Chol-Choled ourselves”? No? Well that’s probably because its an inside joke created out of this particular experience. We now use to describe a situation where we intentionally put ourselves somewhere with good intentions, only to have this decision cause us to push our limits to the most uncomfortable extremes. When Suzie gets Chol-Choled, her body is so tired she can do nothing more than cry (more like a light sob) for hours on end. This creates a pretty depressing mood for both her and Ski who is unable to console her due to his own emotional piggybank, also empty due to the strain of physical discomfort. So how does one Chol-Chol themselves? You trap yourself, then you can only get out by finishing the torture. Our half way point was Traiguen, which took us until nearly five hours to reach. By then the sun was beating down harder than we’ve ever felt (and we’ve been lost in the mountains in Albania). We roll into town only to find that all Tiendas in sight were closed. There was one older man sitting in the shade staring off into nothingness, while another looked at us and yells in unrecognizable Spanish. We pushed into town and asked a few locals where we can get a bite to eat or a coffee. No luck, those big city amenities don’t exist in Traiguen. We finally managed to find one market that is open (the only business in town that isn’t closed or boarded up with splintered, rotted planks that are begging to be repainted). The store sold empanadas (of course), tomatoes, and a variety of knock-off brand cookies. 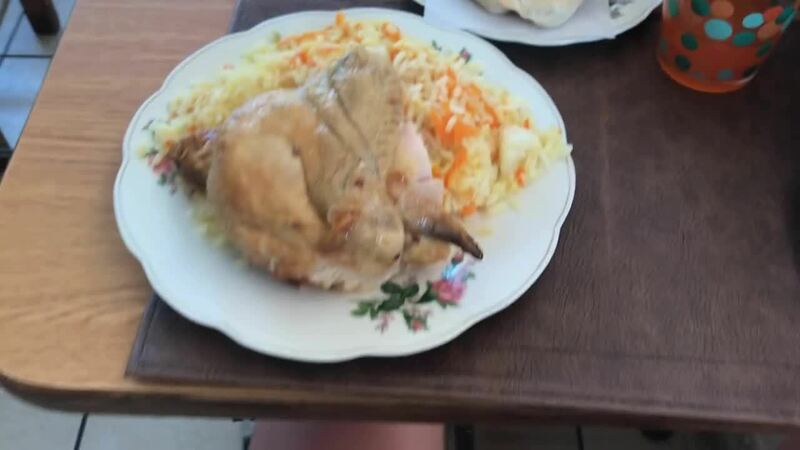 We ate pollo empanadas (regretted that one later) and cookies and managed to get some agua grifo (tap water) from the seemingly only employed person in the whole town. I could go on and on about the brutal hills and heat, but I’ll just leave it at this: these rolling hills are prime for training but be well supplied, well fed, and well watered or you’ll find yourself getting chol-choled. Its a longer 100km than you’re probably used to. Get on the road as early as possible or wait until after 6pm and you’ll find the hills and landscape engaging and physically rewarding. In the heat of the day though, it will be tough to keep a positive attitude and a clear head. After the S-16 we were happy to be on any road that didn’t feel like a death march. The road from Angol to Los Angeles has a few ups and downs but nothing steep and very manageable. We rode on a Saturday and left around 10am. The roads got busier throughout the day, and though the middle had the narrowest shoulders and the worst drivers, the beginning had careful drivers while the end had ample shoulders. For the full rundown of where we are now, where we plan to go, and more interesting stories of our travels in South America, don't miss out on this page!